On the last post, we mentioned the new stamp from the Dutch postal service featuring Postcrossing, which was launched this past Saturday on the Postex event. 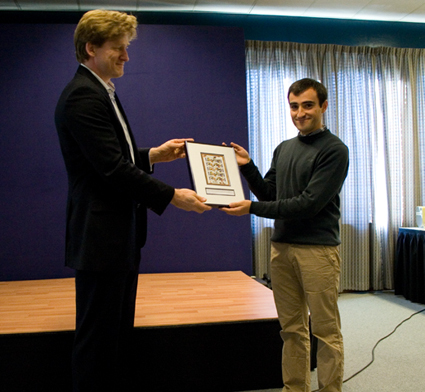 Paulo gave a short presentation about the project, and received the first sheet of stamps from the hands of Berend Dorgelo, from PostNL. As part of the stamp launch, PostNL is organising a contest where Dutch postcrossers can win a travel voucher of 500 euros, if they use the stamps on their Postcrossing cards. To participate, have a look at the contest page. Once again, our heartfelt thank you to PostNL, Raymond68 and all the people who were involved in the process of making this dream come true! Well done to all concerned and good luck to all Dutch Postcrossers with their great competition. So, is there an increase of Dutch people registering??? I love these kind of things! Greetings from Haarlem! and I sent a note to Canada Post! Congratulations - can't wait to receive the first card with one of those stamps on! Well done everyone. I can't wait to get my stamps when I am in the Netherlands next month. Will look for the suited monkey for sure! Well done Paulo and crew for the lovely Postcrossing stamps. If you hear a cheer from Devon you will know I have received my first one!! My main job today is to write to Royal Mail to propose they do Postcrossing stamps for us. Good luck to all in Netherlands for helping to spread the word about Postcrossing around the world. This is a fantastic achievement. Congratulations to everyone connected with it! And let's hope Postcrossing stamps spread worldwide! For the benefit of non-Dutch speakers, the contest referred to involves sending a photocopy of the message side of a Postcrossing postcard bearing a Postcrossing stamp to a certain address. This means that recipients' addresses are being passed on outside Postcrossing. I am looking to purchase a sheet for my collection. Can any of the Netherlands postcrossers tell me how to purchase them or help me out? I'd really appreciate it!!! Well done! I'm waiting to receive one of each stamp. The Finnish post should do the same! I was very happy to discover about the contest when I bought the stamps today. I will participate for sure! I bought 3 sheets of stamps and can't wait to start sending them (currently I have my maximum of cards sent). Finally we have nice stamps - I always thought that our normal stamps were a bit 'boring' comparing to other countries (so I used the very old stamps with guilders). I will be looking forward to send cards with these stamps to you all! I received them today and six postcards with the stamp are going out tomorrow! The contest sounds nice, but like Toucans, I'm concerned about passing other people's addresses to a third party. PostNL should have been more careful about this and give proper instructions to protect other postcrossers' privacy (like blacking out the address). I've notified PostNL about this. What a wonderful recognition of a great project!! Wow! :) What an achievement! A memorial moment for postcrossing. I sent out postcards with these stamps to USA, Japan, Belgium and Ukraine today! I thought that Finns issue the first PC stamp but no, it's the Netherlands! About the privacy, since they are the post the've already seen the adres, otherwise they can't deliver the mail. Well done,Paulo and for the rest of PC Team!!! I'm so proud to be a part of Postcrossing. The U.S. has some lovely stamps, but since they are designated as "Forever" they cannot be sent overseas (from what I understand). I also heard US postal rates are increasing again in January. I often have a line of people waiting behind me when I purchase stamps as I choose the best ones I can to place on my postcards. I remind my local post office personnel how Postcrossers contribute to their business success, and now I can enlighten them on the creativity of PostNL. Way to go Netherlands, Paulo and all involved. I just ordered these stamps. So within a few days I can make a few people very happy when I send some postcards! Oh that is so cool! I hope the Belgian post will get inspired by our neighbours - our international & european stamps are so boring. I have orderd the stamps ! And hope to make 20 people happy with these stamps . Can you tell me where i can buy these stamps? Here in New Zealand we have two type of stamps. 1) Stamps with designs that the Post Shop prints 2) Stamps that one can deisgn themselves and order for special ocassion like birthdays, weddings, etc. I would love to see a closer view of the Dutch Postcrossing stamp. I received my Postcrossing stamps today (hurray!) and already used one on a card. Hope you like it! I've sent a few cards already and tomorrow I send the next 6 with postcrossing-stamp. It's nice to hear from the postcrossers who received the stamps! I'm going to buy more stamps tomorrow! Very cool all invented! I am delighted and congratulate all of the event) I look forward to a card with a stamp. If not difficult, a link to the store where you can buy such a young my collection) Thank you all! good luck! The monkey with the gun is on 2 of the stamps, but why is it an Easter egg? congrats PCNL & hope to receive a card with the stamp! @ fizgig: it might be called an "Easter egg" because in some countries/regions there is a habit of hiding the Easter eggs at Easter so that the children can go and find them. I wonder what other items are hidden in the stamps? For those who have to wait too long for their delivery of PC-stamps: your local Bruna-shop might have them as well! :) Received my postcrossing stamps today. Can't wait to start using them. Just checked out the details on the contest and won't be joining in because of the privacy issues, so don't worry about your privacy if I sent you a card with postcrossing stamp. fantastic. I am so happy for Paulo and postcrossing getting great attention :) Congratulation. These Postcrossing stamps are great! I work in a bookstore in The Netherlands, where we sell these stamps :) And I can tell you, that they are beautiful! Soon someone will receive a postcard from me with a Postcrossing stamp on! Anyone from Holland want to swap with me???? I want these stamps!!!!! Awesome! Just got one of these too! Great, what a good idea, I bought some stamps. And watch out, they will come, maybe to you? I am wondering if there has ever been a stamp designed that illustrates a website...maybe this is the first! This is amazing! As a stamp collector, I will really like to add this to my collection. And it will be great if someone from the Netherlands can send me a postcard with this stamp. Offcourse i will send this stamp to everyone, maybe it's you!!! I received my first postcard with one of these GREAT stamps. Wonderful! WAAAH, I want one too. I will trade an equal amount of OLD unused US stamps from the 40's for a sheet of these. It would be nice if there will be a special DutchPC stamp! There are a lots of Netherlands sending cards to .... Netherlands! Then whe have also original stamps with a datestamp. I just send 10 cards with those stamps. I hope you will like it. to anybody in the world. Yeah, I'm proud ownwer of a sheet PC stamps! Just bought during my trip to NL! I am starting to receive these special stamps. Special cards in my collection. Got my stamps today (2 sheets) and the first 3 postcards with this collectors item are on their way! can I get these stamps? I am in England, UK. Please help. There is a Stamp Election in the Netherlands now and you can also vote for the Postcrossing Stamp! You only have to enter your emailadress and vote for the stamp. Then you get a confrmation mail in which you have to active your vote. I received one of these stamps on a postcard last week! I received one too!!!! I am so happy that Toon from Netherlands sent me. So thoughtful and sweet. Heyhey, I also received one of these nice stamps last week! That´s so great! It's in dutch but you can drag the picture and zoom in on it. The postcrossing stamp is a great idea, but I feel deeply hurt and offended that a picture of bullfighting has been chosen for one of the stamps. Really, is that what the creators think that is a symbol of Spain? For Lord's sake, we do have beautiful things in Spain. Couldn't the stamp feature a building by Gaudi (Holy Family Church, Güell Park), a picture by Picasso(Gernika, Peace Dove), Dali (The Persistence of Memory) or Velazquez (Las Meninas), or just our most famous fictional character, Don Quixote? No, bullfighting had to be chosen as a symbol of Spain, though most Spaniards find it repulsive, has been forbidden in Catalonia by popular demand, and many animal rights organization fight so it gets forbidden in the rest of Spain. Bullfighting is cruel to animals (not only the bulls, but the horses that frequently get DISEMBOWELED by the bull's desperate attacks), cruel to children (who are exposed to torture and violence for fun, and told it's OK) and a shame for most Spanish people. And still it is chosen to appear as a symbol of Spain in the Postcrossing stamp, which only will help to promote the idea that we Spanish people love to torture animals. So shameful that the author of the stamp didn't get informed first that there are more Spanish people fighting to bring this "tradition" to an end, that people actually going to enjoy bullfightings. Sorry about the long post, but I've just received a postcard from the Netherlands with that particular stamp, and even the sender felt bad that such a picture had to be chosen.